State-of-the-art seismological techniques applied to Apollo-era data suggest our moon has a core similar to Earth's. 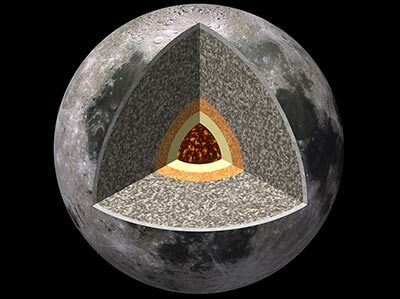 The team's findings suggest the moon possesses a solid, iron-rich inner core with a radius of nearly 150 miles and a fluid, primarily liquid-iron outer core with a radius of roughly 205 miles. Where it differs from Earth is a partially molten boundary layer around the core estimated to have a radius of nearly 300 miles . The research indicates the core contains a small percentage of light elements such as sulfur, echoing new seismology research on Earth that suggests the presence of light elements -- such as sulfur and oxygen -- in a layer around our own core.